If you enjoy playing upbeat slot games, Lost Vegas Slot is unlikely to appeal, but if you’re a fan of horror and suspense, the post-apocalyptic theme of Lost Vegas should be right up your street. It’s a Microgaming slot with zombies and plenty of gore, although it also has dark comedy undertones so you should be able to happily play it with the lights off. What will, however, send delightful shivers down your spine are the 243 ways-to-win pay structure, the Blackout Bonus, the Zombie Fist of Cash Feature, and the Zombie Free Spins Bonus which gives you the chance to play a zombie or a survivor. 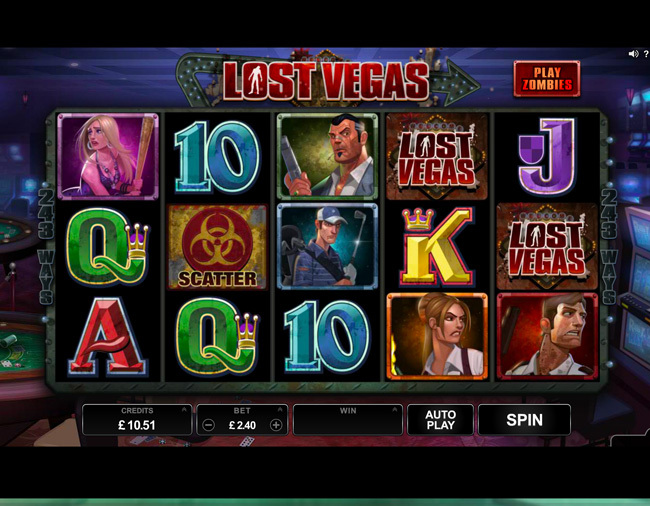 Lost Vegas is a five-reel slot with 243 paylines, and you can play it with between 30p and £45 per spin. The Theoretical Return to Player is 95.77%. What we love most about the Lost Vegas slot is that you can choose to play it in two different game modes – Zombie or Survivors – which you can switch between as often as you like. If you select Survivors mode, the game’s background consists of a dimly lit casino in Las Vegas which looks as though the occupants have left in a real hurry. The paytable symbols feature three male and two female survivors who are all armed with makeshift weapons. In Zombies mode, the background switches to an empty street on The Strip where the flashing neon nightclub and casino signs eerily are the only signs of life. The paytable symbols are also specific to the game mode, and feature five mock-horror zombies including a nurse, a showgirl, and an Elvis impersonator. The wild and the scatter symbol look the same in both game modes. The wild is the slot’s logo and it can substitute for all symbols except the scatter. The scatter is the red-and-gold symbol, and three or more trigger the Free Spins Bonus. Survivors Free Spins comes with a Stash Feature where any low-value playing card symbols are removed from the bonus reel set, awarding cash wins with each symbol that’s removed. Zombies Free Spins uses the Infection Feature where full stacks of the five zombie characters can transform single wild symbols into stacks of wilds. Spins Bonus with only one scatter. The Zombie Fist of Cash Bonus in the Lost Vegas slot can also randomly activate on a non-winning spin to give you an instant cash prize.